where is a constant. More realistic equations of state complicate the analysis, but do not significantly modify any of the physics results (Priest 1984). Note that is the coronal sound speed. is sub-sonic throughout the domain . increases with , attains a maximum value around , and then decreases with . a unique solution for which increases monotonically with , and . a unique solution for which decreases monotonically with , and . is super-sonic throughout the domain . decreases with , attains a minimum value around , and then increases with . These four classes of solutions are illustrated in Figure 7.2. 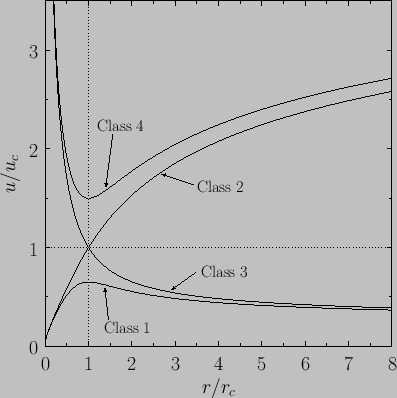 Figure 7.2: The four classes of Parker outflow solutions for the solar wind. Each of the classes of solutions described previously fits a different set of boundary conditions at and . The physical acceptability of these solutions depends on these boundary conditions. For example, both Class 3 and Class 4 solutions can be ruled out as plausible models for the solar corona because they predict super-sonic flow at the base of the corona, which is not observed, and is also not consistent with a static solar photosphere. Class 1 and Class 2 solutions remain acceptable models for the solar corona on the basis of their properties around , because they both predict sub-sonic flow in this region. However, the Class 1 and Class 2 solutions behave quite differently as , and the physical acceptability of these two classes hinges on this difference. at large , which cannot be matched to the much smaller pressure of the interstellar medium. Obviously, Class 1 solutions are unphysical. It follows from Equation (7.64) that as . Thus, the Class 2 solution yields at large , and can, therefore, be matched to the low pressure interstellar medium. where the constant is determined by demanding that when . Note that both and can be evaluated in terms of the coronal temperature, , via Equations (7.67) and (7.68). Figure 7.3 shows calculated from Equation (7.77) for various values of the coronal temperature. It can be seen that plausible values of (i.e., - K) yield expansion speeds of several hundreds of kilometers per second at 1 AU, which accords well with satellite observations. The critical surface where the solar wind makes the transition from sub-sonic to super-sonic flow is predicted to lie a few solar radii away from the Sun (i.e., , where is the solar radius). Unfortunately, the Parker model's prediction for the density of the solar wind at the Earth is significantly too high compared to satellite observations. Consequently, there have been many further developments of this model. In particular, the unrealistic assumption that the solar wind plasma is isothermal has been relaxed, and two-fluid effects have been incorporated into the analysis (Priest 1984). 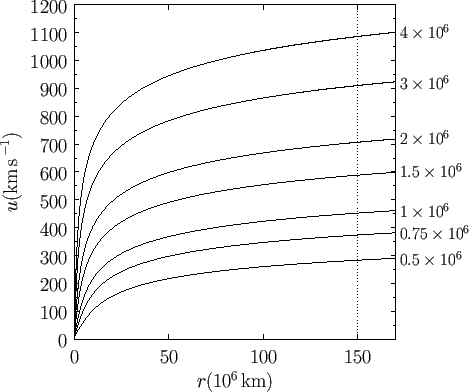 Figure 7.3: Parker outflow solutions for the solar wind. Each curve is labelled by the corresponding coronal temperature in degrees kelvin. The vertical dashed line indicates the mean radius of the Earth's orbit.